Every voluntary action of ours is backed by some Hope. Some people hope it'd bring them success, some hope that it'd do good to others. 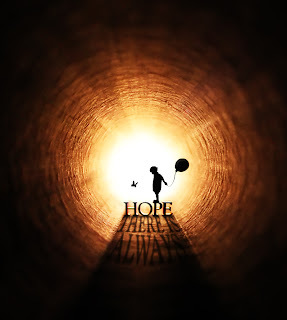 Hope is an important entity in our lives. Not to be a spoilsport but obviously I am writing this with a hope that my readers will like my views (or at least let me know if I went wrong somewhere). Hope keeps the world moving. The recent flick 'Life of Pi' reaffirms the fact persistently. So when on a fine morning when some of my friends on twitter were discussing their opinions, it suddenly came to my mind: Hope is just like Energy. And I had promised them that I would write something about it soon. Now what, if I may ask, is the Law of conservation Energy that we all have crammed up during our school days? It is: Energy can neither be created nor destroyed; it can only be transferred from one form to another. Consider the same for Hope. What is Hope? It's a reason, a thought, that makes you do that which you don't want to do, or perhaps it's a phenomena that gives you a reason to last another day at your work. So it is really what moves us. Thus, Hope is like Energy at an emotional level. Hope too cannot really be created: You got to have some Hope all the time, and if you are feeling low , someone would stop by to encourage you to do what you should do! That's an example of how Hope gets transferred from one being to another. Hope cannot be destroyed as well. You might lose hope temporarily, but you will always get it back if things fall in place the way you wanted them to. Hope stays with you in the end. Just like energy , hope has got forms as well. There's Kinetic Hope: Once you do something, it drives you, motivates you to continue. There's Potential Hope: The one that gets converted to Kinetic Hope every now and then and drives you. So what we see is that, Hope does play a role in our lives the way energy drives the mechanism of the world. A passing thought: Could one day, just like Energy, we would see an era where people could sell/buy Hope? Seems a little bit of an exaggeration but to me it seems quite possible. What do you think? P.S. : I am keeping the post open to editing. So if you may want to add some more points in this post, you are most welcome. Put your thoughts in the comments section. Your contribution will be added with due credits. Hope is an energy but not something like charging batteries. The prospect of transaction will destroy the sanctity and purity of hope. Well hope in the coming times can't be bought because when you relate it to emotions,emotions are one thing which i don't think you can buy or sell but yes that transfer thing can go on as you mentioned in your post. I seriously like your blog(realization)!